Seeing a photo of himself during the holidays was Simon's reality check. His beer gut was getting in the way of life. He traded in the endless six packs of booze for shredded abs! In 2010, I saw a photo of myself during the holidays and decided enough was enough. I was done eating bad food. I was out of shape and wanted to do activities with my son Billy. I could see I had a beer belly and decided to get rid of it before next year's holidays. I immediately joined the gym with a now or never attitude. 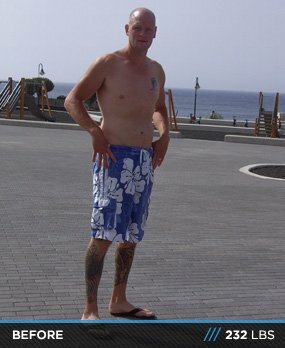 I joined the gym in July 2010 and saw progress after six months. I changed my entire diet and lifestyle. No more beer for me. I wanted a six-pack of abs and was going to get them. I've been on a clean diet for a year now and feel totally dedicated and committed to fitness and healthy eating. I feel better about myself and have more confidence. The hard work, dedication, and commitment pays off. You have to do it for yourself. If you do it for anyone else, you won't stick to it. You have to enjoy working out and find a program you enjoy. No excuses. If you can sit in front of a TV for an hour a day, you can give your body a workout for an hour a day. Exercise and nutrition go hand in hand. You can't do one without the other. You ccan own the best car out there, but without fuel you're going nowhere fast. Keep a record of your training and nutrition. I analyze what I eat in at www.fitday.com. This allows you to adjust what you eat. I eat seven meals a day, seven days a week. I perform a four-day split with rest periods at 45-60 seconds between sets. I do abs in a circuit with no rest until circuit is compete and rest 30 seconds before starting again. I run on this program for 6-8 weeks then change it up. I always do a warm-up before starting my training. I have good will power and determination. I gave up smoking a long time ago and I don't miss alcohol one bit. If I put my mind to something I do it with no problem. Sometimes the smell of my son's pizza gets me, though. Who knows where the future will take me. I plan to stay in the same shape and do it naturally. Age is just a number. I'm in the best shape of my life and I want to be better. If I can do it, so can you. You owe it to your body to be healthy. Remember, it's not a diet; it's a new lifestyle. You need dedication, discipline, and patience to maintain or get the body you want. During training, I need music on my Ipod. This keeps me focused and prevents people from trying to chat with me in the middle of a workout. BodySpace keeps me motivated by looking at people's great physiques. 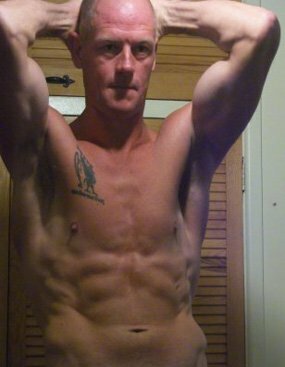 I'm learning more about training and nutrition with the help of Bodybuilding.com. Anyone who wants to share information should drop me a line, or if I can help anyone on their journey, please let me know. Keep the fire burning within. A big thanks to my wife who keeps the fridge and cupboards full with all my good food.